At that time, the three-quarters century mark for the comedy writer must have been far, far into the unforeseeable future, but today Woody Allen turns 75. Groucho, sadly, is no longer around to attend the party. Today is as good as time as any to look Woody’s long career, which is still continuing, producing on average one film a year, and hopefully will well into the future. Woody has come a long way since he received the birthday invite from Groucho. At the time, Allen was one of the highest-paid stand-up comedians in the world and was a sought-after writer, but had yet to direct his first film. Groucho was taken with the young comic’s sharp wit, remarking “he is smart enough to be the fifth Marx Brothers.” Years later, Allen would comment on their unlikely friendship, “he was and admirer of mine, and I was a worshiper of his.” Woody had reluctantly been drawn into movies, taking a role in Casino Royale, which allowed him to live on studio expenses in London while writing his first Broadway play “Don’t Drink the Water.” His first film script, What’s New Pussycat?, as directed by Clive Donner, was an embarrassment that he would have liked to quickly forget, if only it had not been such a big success at the box office. After that frustration, he swore that he would never again write another film script unless he could direct it himself. That is what he has been doing ever since, producing 40 feature films and counting. As a boy, Allan Konigsberg became fascinated with the glamor of magic tricks, and spent hours in his room practicing magic tricks. As a teenager, he was thrilled to run into Milton Berle in a magic shop, and insisted on demonstrating his sleight of hand, but was so nervous he couldn’t do a simple trick. The aesthetics of conjuring runs through the films that boy would make as an adult Woody Allen. The boy magician appears in Stardust Memories (1980), doing tricks and donning a cape to fly away when the expectations of the adult world are too much for him. In Oedipus Wrecks, his contribution to the trilogy film New York Stories (1989), Allen plays a successful lawyer with a strained relationship with his nagging mother. When he takes her to a magic show and she volunteers to disappear into a cabinet, he is frantic, then relieved when she never comes out. In Alice (1990), a Chinese doctor who dabbles in magic spells adds meaning to the empty life of a rich housewife. 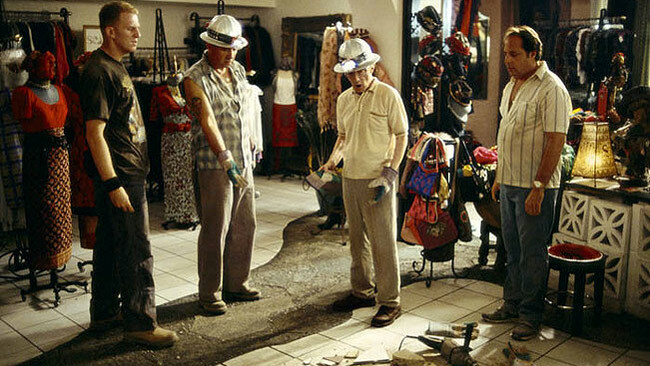 Alice includes scene of hypnotism, which also comes up in The Curse of The Jade Scorpion (2001), in which a clever jewel robber puts subjects into a trance so they can do his dirty work. In Shadows and Fog (1992), Allen plays a lowly file clerk in a Kafkaesque tale of a town terrorized by a mysterious killer. 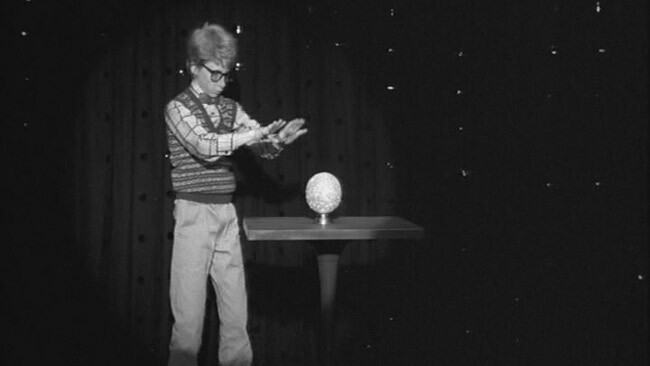 Allen comes face-to-face with the murderer, but is saved by the magician Armstead, who takes him inside his magic mirror, and into some alternate dimension. By jumping through the mirror, he makes the choice of fantasy over reality, a dichotomy that comes up over and over in Allen’s films. As a boy growing up in Brooklyn, Allan Konigsberg would retreat from the heat and the tough street kids of Flatbush by going into one of the many air-conditioned movie theaters in the neighborhood. 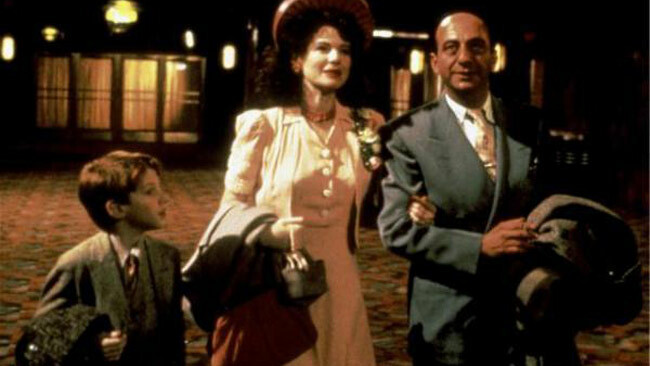 Allen’s theatrical play “Play It Again, Sam,” which was later turned into a film with Allen in the lead role is about a man who escapes from reality into the world of the movies, which is also a theme of The Purple Rose of Cairo (1985). The films he saw there would live their imprint in his own films. The comedies of Bob Hope are a clear influence on Allen’s early comedies such as Love and Death (1975). The silent comedy of Chaplin and Keaton would influence Sleeper (1973), set 300 years in the future when spoken communication is kept at a minimum. The musicals of Judy Garland and Bettie Hutton inspired Everyone Says I Love You (1996), a modern-day musical. An early experience for the young Allan Konigsberg would have a strong effect on the rest of his life and a good number of his films. When he was 5 or 6 years old, Allen’s father took him into Manhattan for the first time. Taking the train from Avenue J in Brooklyn, they came up to street level at Times Square. The sheer sense of wonder that filled the boy never seems to have left him. That first visit to the city was faithfully recreated in Radio Days (1987), in which Seth Green plays a version of young Woody Allen. At the time of the films production, the real Allen was perhaps the most well-known resident of Manhattan, and used his influence to get permission to film at the Radio City Music Hall and the last operational automat in the city. His father, who was born in 1900 and would live a full century in the city, would take his young son for walks, pointing out where speakeasies had been and where gang shootings had occurred, not knowing his was scouting locations for his son’s Bullets over Broadway (1994). The ‘20s glamour of Manhattan, along with the depressed outlaying outer boroughs, would also appear in The Purple Rose of Cairo (1985), when the character of the film within the film go out for a “madcap Manhattan weekend.” As the title character in Zelig (1983), Allen receives a Time Square tickertape parade in the style of Charles Lindbergh. Allen’s love for the city has never left him, even after he has gone to film in London, Barcelona and Spain. Manhattan (1979) famously opens with Allen’s narration over a montage of shots of the city that is the most enduring paean to urban life ever committed to film. At the age of 16, Allan Konigsberg became Woody Allen, and was soon publishing jokes in New York newspapers. While still in his teens, he was writing gags for TV variety programs, and by his 20s, he was performing standup comedy. Working in show business opened up a whole new world for the young talent, a world inhabited well-intentioned, but sometimes sleazy people. It is this world that forms the setting of Broadway Danny Rose (1984), in which Allen plays the most dedicated manager of talentless nightclub acts. Allen has always insisted in interviews that he can only play two kinds of characters, bums and lowlifes because of who he is, and intellectuals because of how he looks, and that as a beer-drinking sports fan, he falls into the first category. Allen plays bums and lowlifes in Take the Money and Run (1969), his first film as a director, in which he is an inept bank robber whose stick-up notes are too illegible to get him any money and a similar role in Small Time Crooks (2000), in which he is the leader of hapless bunch of criminals who have more success with their front than with their failed heist. Allen has insisted in interviews that his true interests are baseball, basketball and jazz, and he has never had intellectual aspirations—he only read books to keep up with his dates. Whatever the reason, the books he picked up have stuck with him. 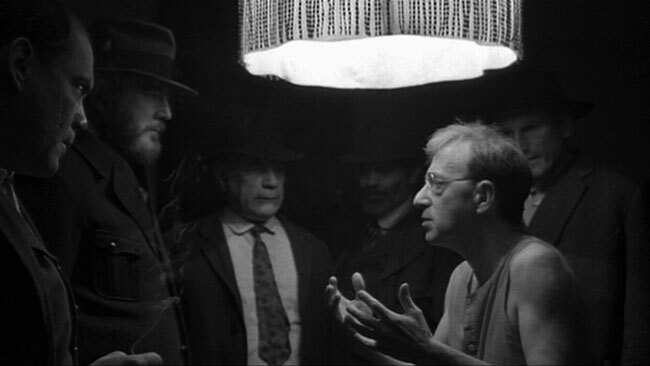 Shadows and Fog (1992), an homage to German expressionism, draws from the fiction of Franz Kafka. Crimes and Misdemeanors (1989) and the recent Match Point (2005) and Cassandra’s Dream (2007) all deal with Dosteyevskian themes of guilt and moral responsibility.